Kite Studio stocks type #1443 Tyvek. This protective material is a miracle of science from Dupont. It is from a family of tough durable sheet products of high-density polyethylene fibers. The sheet is formed first by spinning continuous strands of very fine interconnected fibers, and then bonding them together with heat and pressure. Great for kites, and banners. Using it between layers adds an opaque barrier. Type 10, Type 14 and Type 16. The Type 16 has microperf holes in it, the Type 10 is stiff (the house wrap) and the type 14 is softer. 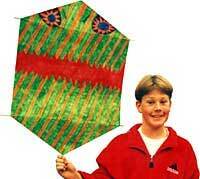 Kite Studio also has kits of twenty kites that are are made from Tyvek and wood dowel. Great for Scouts, Clubs, and Kite Festivals. Find them in the "Kites" section of the on-line catalog. Kite Studio's Tyvek 1443 is approximately 1.2 oz/sq yd, 5.3mils thick, tensile strength 7.9 pounds. Tyvek can easily be colored with crayon, marker, or paint. Seams and hems can easily be made with tape, glue, or sewing.